What Mailgun Triggers and Actions are Supported? New Unsubscribe Event - Track Unsubscribe Events via Callback URL. New Complaint Event - Track Unsubscribe Events via Callback URL. New List - Triggered when a new mailing list is added to your account. New Open/Click Event - Webhook for Tracking Opens/Clicks. New Bounce Event - Track Bounce Events via Callback URL. New Log Data - Mailgun logs most actions within your account, use this trigger to push events to other services. New Failed Delivery Event - Track Failed Delivery Attempts via Callback URL. New Delivery Event - Track Successful Delivery Events via Callback URL. New Mailing List Member - Adds a new member to a mailinglist. Send Email - Send an email, via your Mailgun account. 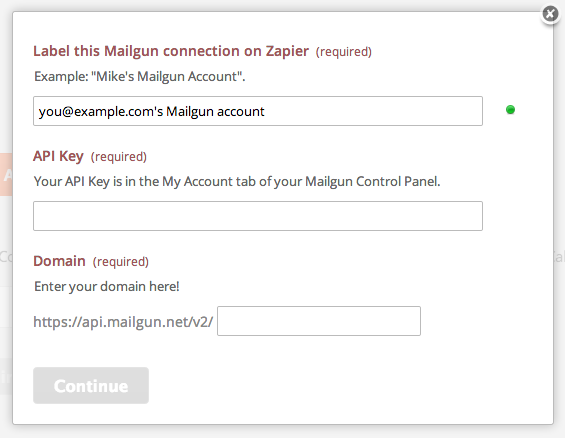 The first thing you'll need to do to get started with hooking up Mailgun with Zapier and hundreds of other services is to add your Mailgun Account to Zapier. Click to add a Mailgun account in your Zap. 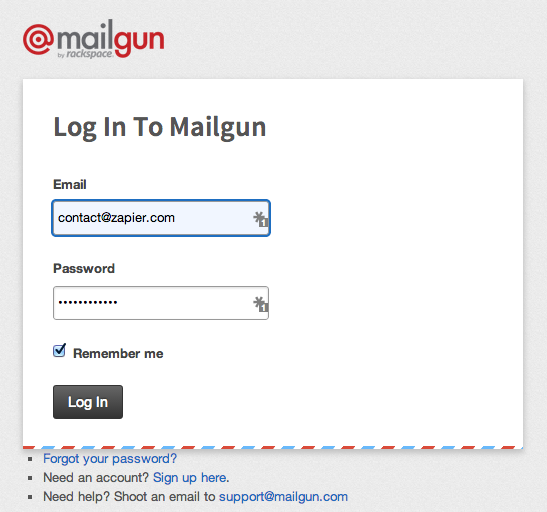 You should then log into your Mailgun account to retrieve your API key and domain. After logging into your Mailgun account, both your API key and domains will be located right on the main page. Next you will place your API key and domain into the respective fields under your account title field. Entering your API key and domain finishes the process! Your Mailgun account is now connected to Zapier. Yes! In the Send Email action there are fields for both an HTML body and Plain Text body of the email message. We currently don't have attachment support for Mailgun at this point in time, but will hopefully be able to add that kind of functionality in the future. If you're using an EU region Mailgun account, your account isn't currently supported on Zapier at this time.